The tides in our oceans and seas are unrelenting. They flow without ceasing, churning our oceans, creating waves… and they wait for no one. Often we want to do something, but hesitate- hoping for that one perfect moment where everything will work. But the tides wait for no one- this is the time to take the plunge, and let them sweep you into a new adventure. 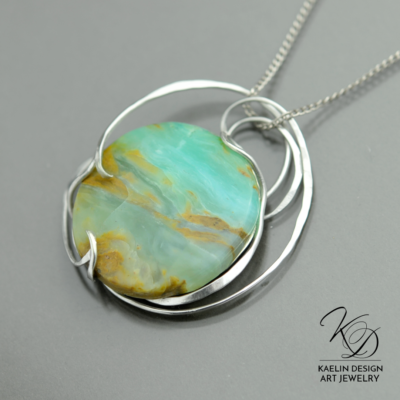 Tideswept features a custom-cut Peruvian Blue Opal, set in hand forged sterling silver. I loved the back of this stone just as much as the front, so I pierced the backplate to reveal segments of the stone. 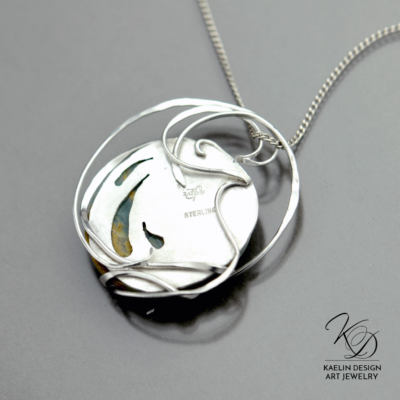 It measures 1.75 inches in length, and includes an 18 inch adjustable sterling silver chain.